Please send files as an Adobe Illustrator.AI or.EPS file. These are the most compatible types of artwork. Additional fees may apply to other file types. All text should be converted to curves, paths or outlines depending on the terminology of the application used. If you cannot convert the fonts to outlines, the PC True Type or Adobe Type 1 fonts must be included. 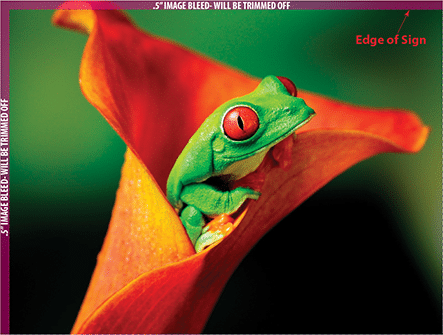 Files should be set up using the CMYK colorspace at 100-150 DPI at full size (the size that it will be printed). Final output files should be flattened and saved in .TIF format. Be sure that all images used within your design are at least 100-150 DPI at full size. Files should be set up using CMYK color space. Artwork for banners requires NO BLEED unless 2-sided. All FULL-COLOR designs (non-banner) need a .5“ bleed on the TOP and LEFT sides. Files should be saved in PC format & can be saved to a flash drive, a CD/DVD or emailed to the Sales Associate working for you. For transfer of files that are too large for email, we recommend using the free service www.SendSpace.com. VECTOR ART – Vector Artwork such as Adobe Illustrator files, are made of closed lines & shapes. These files can be made to any size for output, without distortion. File Types Supported: AI, EPS, PDF. Bitmaps or raster images are made up of tiny dots. If you magnify the image, you would see these dots, which are crowded next to each other to form the image. A bitmap does not contain the lines and shapes that a Vector file does, and are commonly used for more complicated signs and must be printed. Any bitmap/raster images that will be used in a sign must be 100-150 DPI at full size (the size at which it will be printed). File Types Supported: BMP, TIF, JPG, PSD. DPI (DOTS PER INCH) OR RESOLUTION – DPI or resolution refers to the amount of data, expressed in dots per inch, at which a given bitmap image is stored. If you have a bitmap that is 1 inch by 1 inch, at 75 DPI, you have 5625 little dots in it. If you have the same size bitmap, 1“x1“, at 300 DPI, you have 4 times the amount (90,000) of dots in the bitmap. This means the dots are smaller, so the image is more crisp, and clear, and can be resized to a larger size. High-resolution files will result in very large files, & slower processing. Copyright © 2019 DVC Signs.